PORRIDGE FOR THE SOUL: WORD OR SPIRIT? The battle that has been raging for centuries: Should the believer emphasise the Word or Holy Spirit more? Some believers ground themselves so strongly in the Word that the Holy Spirit has little relevance in their lives. They become wary of spiritual gifts or “being led by the Spirit”, thinking that by doing so they may be opening themselves to self-deception and counterfeit spirits of darkness. So they reason it’s better to play it safe by staying in familiar territory. In contrast, others believe in visions, dreams, word of knowledge, prophecy, healing and deliverance—the whole exciting realm of moving in the spiritual gifts, being guided by specific promptings of the Holy Spirit. They do make mistakes along the way but they are willing to pick themselves up and learn—even from those more experienced in such matters. 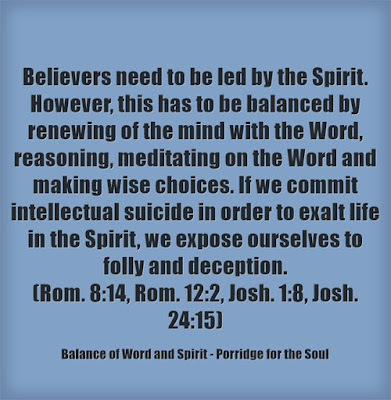 Whilst renewing the mind with the Word is an important key to spiritual transformation, we must not put intellectual pursuit on a pedestal and neglect other key areas like obedience and the role of the Holy Spirit. 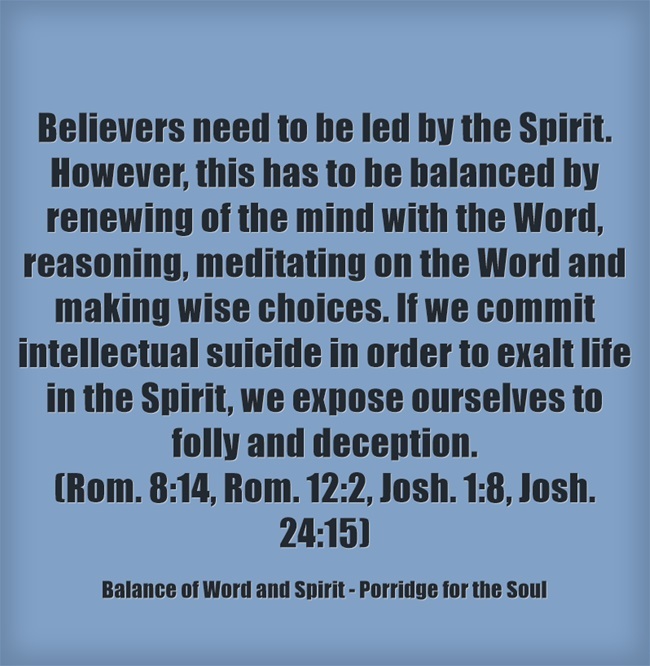 Recognising the role of the Holy Spirit and being able to sense His leading are just as important as renewing our minds with the Word. Someone rightly puts it: “Too much Word and you dry up, too much Spirit and you blow up, the Word and the Spirit and you grow up”. “It is the Spirit who gives life; the flesh accomplishes nothing. The words that I have spoken to you are spirit and life” (John 6:63). Herein lies the connection between the Word and Spirit. Both are equally important. We need the Word but it needs to be quickened by the Holy Spirit; otherwise it accomplishes nothing. The rhema word is God’s word directed to us specifically in our unique situation, just like how He spoke to Philip. Just feeding on the Word without the revelation of the Holy Spirit is useless. It is just head knowledge and may lead to an inflated ego. The apostle Paul emphasised the futility of trying to keep the written law without the empowerment of the Spirit: “He has made us competent as ministers of a new covenant—not of the letter but of the Spirit; for the letter kills, but the Spirit gives life” (2 Corinthians 3:6). However, if we are not equipped with a proper understanding of the Word, moving in the gifts and power of the Holy Spirit may be dangerous. We may be treading on thin ice—what borders on spiritual mumbo jumbo. 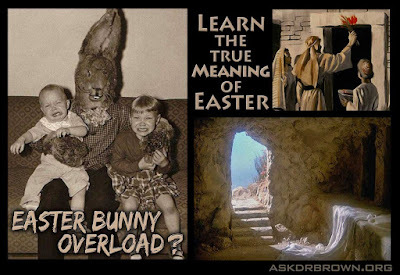 We may also be opening ourselves to self-deception and deception by dark spirits. This issue reminds me of my diabetic patients’ query: Which is more important for their well-being—medicine, diet or exercise? The answer is, of course, ALL are equally important. Similarly, both the Word and Spirit are equally important. And may I hasten to add, obedience to the Holy Spirit. Just like the three legs of a stool, the Word, Holy Spirit and obedience are all equally important if we are to walk in power and victory—in our personal lives and ministry. Finally, what do you think is the true measure of a believer? Does it rest solely on how much anointing or power he or she has? Or how many spectacular feats he or she can perform? Are there not other more important considerations such as an abiding relationship and intimacy with God, obedience, self-denial and faithfulness? The foregoing does not imply that spiritual gifts are unimportant. The moral of the story is that we must not put the cart before the horse. Presumptuous faith, failure to walk closely with God, discern and do His will could prove disastrous finally for many on the day of judgment: Not everyone who says to me, ‘Lord, Lord,’ will enter the kingdom of heaven, but only the one who does the will of my Father who is in heaven. Many will say to me on that day, ‘Lord, Lord, did we not prophesy in your name and in your name drive out demons and in your name perform many miracles?’ Then I will tell them plainly, ‘I never knew you. Away from me, you evildoers!’ (Matthew 7: 21-23). Are the supernatural manifestations in church today invariably of divine origin? 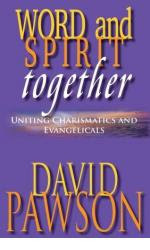 "This book is, without doubt, David Pawson's best examination and solution for Word and Spirit to meld together, as the Lord intended it to do. The tendency in the church is for an unspiritual emphasis of one factor over another, which emasculates and separates either the Word or the function and ministry of the Holy Spirit. Just examine the state of a number of Christian churches where Evangelicals regard modern Charismatics with a great deal of suspicion, and vice versa. Personally, I have spent many years with a foot in both camps and concur with much of David's assessments about this condition. We all have spiritual baggage which needs dumping or adjusting to bring us to the state that the Lord requires of us. A great book which shows us the way out of the debilitating dilemma." — Reverend R.G. Johnson. (Review of above book). I hope I have presented a well-balanced view on this issue—whether believers should emphasise the Word or the Holy Spirit. Having Pentecostal as well as Baptist roots is a plus factor. It helps me to see the issue from different angles. Being a believer for the past forty years also helps. DOES FINANCIAL PLANNING NEGATE FAITH? SHOULD CHURCHES GO INTO SOCIAL MEDIA? HOW SHALL WE LIVE IN THESE TURBULENT TIMES?